Modular houses brought to life in a North Yorkshire factory have been erected onsite at Gateshead Innovation Village just hours after arriving on a lorry. The first two semi-detached houses have been positioned and constructed at Gateshead Innovation Village, a live research project led by Home Group, one of the UK’s biggest providers of homes for sale and affordable rent. The modular volumetric units, manufactured by Home Group partner ilke Homes, who deliver precision-engineered homes at scale, were created in its factory before making the journey on along the A1 to Gateshead, where they have been placed onsite ready for Home Group customers to move into when construction completes in early 2019. Arrival of the modular units mark the beginning of construction of the 41 homes at Gateshead Innovation Village, which will see a range of house designs take shape on the one site. The scheme will allow Home Group and its partners to compare six different types of modern methods of construction to traditional builds and is supported by national housing agency Homes England and Gateshead Council. Brian Ham, Executive Director of Development at Home Group said: “This is an incredibly exciting and pivotal time for this project. It not only marks the beginning of the build phase of Gateshead Innovation Village, it has also seen us create our first ever modular home that will house our customers. “ilke Homes has delivered the first of five different types of modular homes, with the other four being supplied by different manufacturers who use different techniques for build, so we can test modern methods of construction in its entirety. Bjorn Conway, CEO, ilke Homes added: “Gateshead Innovation Village is a hugely exciting project for the UK’s housebuilding sector and we are pleased to partner with Home Group on such an innovative research scheme. The construction of the first homes at Gateshead Innovation Village demonstrates the appetite within the construction industry to embrace modular housing. “At ilke Homes, our mission is to provide a real solution to the UK housing shortage. 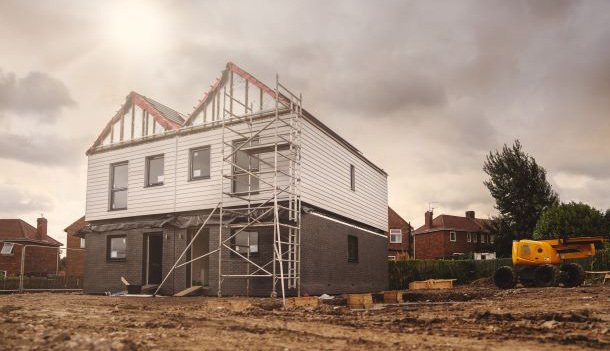 We believe, modular housing is integral to increasing the UK’s housing capacity to ensure that families have access to affordable homes by facilitating more efficient housebuilding. Rob Pearson, Homes England’s General Manager for the North East, Yorkshire and the Humber added: “Addressing the demand for new homes requires different approaches and modular housing has a key role to play. Gateshead Innovation Village is an ambitious project and Homes England is proud to support its delivery of high-quality, energy-efficient, manufacturing led homes delivered at pace through our Shared Ownership and Affordable Homes Programme. The second type of modular house designed by North East LFS are also under construction and will be completed in the coming weeks. Home Group and its partners are documenting the full project through a range of multimedia. To keep up with the developments, visit: www.homegroup.org.uk/gatesheadinnovationvillage.